PORT HUENEME, Calif. - Nearly 40 medical, communication and support staff from service commands across the United States will join the 30th Naval Construction Regiment (NCR), based at Naval Base Ventura County, and depart May 17 in support of humanitarian mission Pacific Partnership 2014 (PP14). At the invitation of host nations, PP14 unifies the efforts of partner nation militaries, host nation civilian agencies, and non-governmental organizations (NGO) to strengthen the collective ability of the international community to operate as a team in delivering foreign humanitarian aid in times of natural disaster or crisis. In its ninth iteration, PP14 is the largest annual multilateral humanitarian assistance and disaster relief preparedness mission conducted in the Asia-Pacific region. Navy Seabees from 30th NCR are traveling to Indonesia and East Timor to join up with teams of medical and engineering personnel, veterinarians, logisticians, military musicians, dental technicians, electronic communication specialists, U.S. Army civil affairs representatives, partner nations and non-governmental organizations in an effort to build capacity, strengthen relationships, improve interoperability and better prepare teams to respond to natural disasters or crisis. "It is an incredible honor to work with such a diverse group of people. We're all fortunate to embark on a mission focused on helping people in need while working in close collaboration with our partners. I am proud of everyone we're taking on this project, and I look forward to what work we'll be able to accomplish as a joint, multinational group," said Capt. Rodney Moore, commodore of 30th Naval Construction Regiment. "I also look forward to exchanging expertise with our allies, partner nations and the greater humanitarian community. Preparing and training in a peacetime state gives us a unique opportunity to leverage resources and work together to make communities safer and increase our ability to assist the local populace should a natural disaster of crisis arise," said Moore. In addition to leadership provided by 30th NCR, the team includes a deputy phase commander and military teams from New Zealand and Australia. 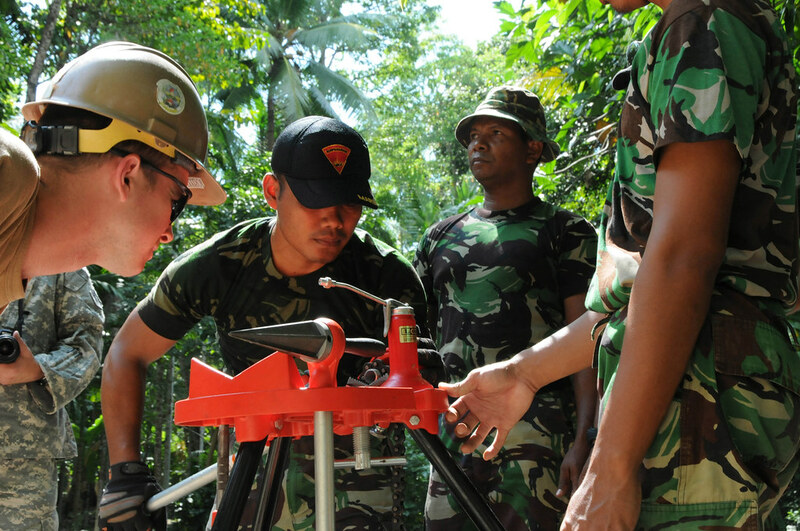 Currently, an Indonesia advance team, with help from local contractors and members of the Indonesian National Armed Forces, is making repairs to a school roof, building a medical facility and installing solar pumps for two wells. Building on the lesson's learned in prior missions, PP14 not only enables new friendships and cements existing ones, but the approach this year is to work with local providers to improve their own skills so that they can then implement locally. This more sustainable "train-the-trainer" approach empowers leaders to better serve the needs of the people by giving them the knowledge necessary to make a positive difference in their communities. "I've never been on deployment before, and this is my first duty station. I volunteered for this mission because I want to go overseas, see another country and help other people. I already do a lot of community service volunteer work, so getting the chance to do this in another country is such a valuable opportunity," said Electronics Technician Seamen Lyrissa Tuyin, from Covina, Calif.
Pacific Partnership missions to date have provided medical care to approximately 250,000 patients, veterinary services to more than 37,000 animals, accomplished more than 170 engineering projects, and enabled critical infrastructure development in Cambodia, Federated States of Micronesia, Indonesia, Kiribati, Palau, Papua New Guinea, Republic of the Philippines, Republic of Marshall Islands, Samoa, Solomon Islands, Timor-Leste, Tonga, Vanuatu and Vietnam.